just west of the corner of Windermere Rd and Doon Drive/Tetherwood Blvd. Parking is available in front of and behind the building. Overflow parking on the front lawn. NO PARKING on Tetherwood Blvd., please. 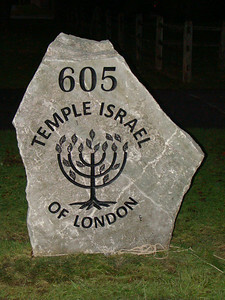 Note: Some events are held at the London Jewish Community Centre, 536 Huron Street (map) Note: JCC parking lot is shared with London Hebrew Day School and Congregation Or Shalom.